Die Fanauswahl: What makes a monster and what makes a man? Die Fanauswahl: Those animators should be tortured for destroying Clopin's gypsy awesomeness! why do Du like clopin? In some places on the internet Du can find Fans claiming Clopin got married to a girl named "Chantal" in canon. Well, as far as the sequel can even be called canon, 'cause this is where it was supposed to have happened, in a deleted scene. Now, this deleted scene is sagte to have been on the US version of the movie, but is obviously nowhere on the internet, and either nobody found it to be important enough, oder it simply doesn't exist. When googling, I found no reliable sources on this topic also. Disney's Hunchback of Notre Dame is offically coming to the Broadway stage! I Liebe the Musik and Im interested to see what they will do! "In a Kürzlich interview, Alan Menken has confirmed an American revival coming soon to New York"
A series of AMAZING Clopin fanfiction concerning his relationship with a gypsy girl named Herlikin. It was once the most beliebt and read fanfiction on the web. It's amazing. Go read! a comment was made to the poll: What is your Favorit quote from Clopin? 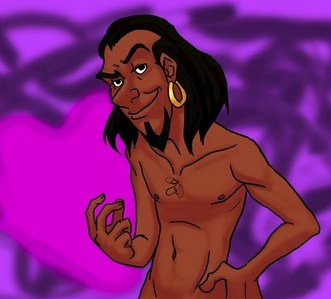 What was supposed to happen to Clopin that Disney did not include in their film? He was supposed to run away. He was supposed to fall in love. He was supposed to be murdered. He was supposed to commit suicide. where do Du like him about?